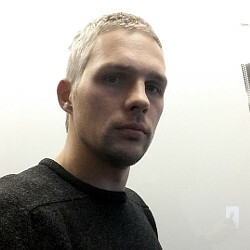 EasyFlashUpgrade.net is the PUP that uses misleading techniques to prevent removal. Use Reimage to locate malicious components and get rid of them faster than with uninstall instructions. A full system scan blocks virus reappearance and prevents traffic to malicious domains. How can EasyFlashUpgrade.net hijack my computer? How to remove EasyFlashUpgrade.net virus? PC security experts warn about misleading EasyFlashUpgrade.net pop-up ads and highly recommend to keep your computer protected to avoid them. These ads may show up on each of your web browser, including Google Chrome, Mozilla Firefox, and Internet Explorer if an adware-type program gets inside the system. It's a potentially unwanted program that may be used by cyber criminals in order to implement their suspicious activities. Even though it's not a virus, people have already reported that it seems to be a very stubborn application that may sometimes be difficult to detect and remove. That's why we always recommend using a reputable anti-spyware, such as Reimage in order to get rid of such and similar programs. If you have already started seeing EasyFlashUpgrade.net popups, you should consider privacy related issues in the first place. That's because an adware that is related to this advertising platform may continuously monitor your online activities and accumulate such information as mostly visited websites, time spent on them, search queries, data entered, your PC's location, IP address, email address and so on. Even though such data is not considered as personal, it may also be used to trick you. In addition to that, you should not ignore EasyFlashUpgrade.net ads because they may try to spread other useless or even dangerous programs. 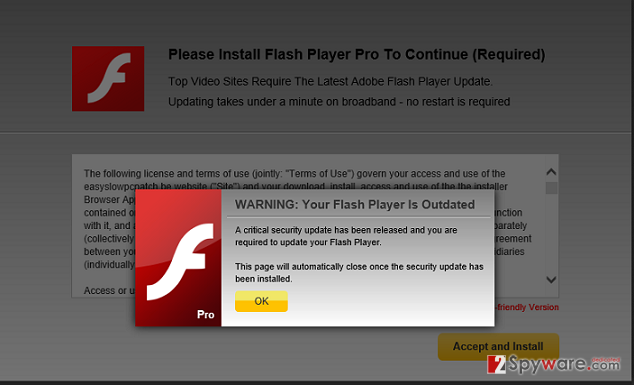 As the name of those popups suggest, they usually usually related to Flash Player software. It may be offered to install it or urged to update it in order to continue the browsing. Please, NEVER click on 'Update now', 'Download the update', 'Click to install' and similar buttons and remember that it's just a trick used to spread other potentially unwanted programs. If you have already clicked on them, it's very likely that your computer is full of suspicious programs and you need to fix it as soon as possible. Such and similar programs can be spread around using various unfair methods. However, at the moment of writing, the most popular one is referred to as 'bundling'. It's closely related to various freewares and sharewares and cannot be implemented without them. To be more precise, 'bundling' allows to fill free software with 'additional components' and spread them in one pack. Even though people are warned about various plug-ins, add-ons, toolbars, and extensions that are going to be installed along with their selected freeware and are capable of opting out of them, they often fail to do that and later suffer from EasyFlashUpgrade.net redirects, misleading pop-up ads, slowdowns and similar issues. The main problem is that 'optional downloads' may be disclosed in a misleading manner and people who rush to install freeware can easily skip them unnoticed. To avoid this happening, you should take your time when installing any kind of freeware and follow everything step-by-step. Always select Advanced or Custom installation option because it will disclose all available check boxes and will allow you to deselect additional components. If you have already started seeing fake update alerts brought to you by EasyFlashUpgrade.net, you should not ignore their presence and eliminate a related adware to stop them from appearing. Here, look for EasyFlashUpgrade.net or any other recently installed suspicious programs. Wait until you see Applications folder and look for EasyFlashUpgrade.net or any other suspicious programs on it. Now right click on every of such entries and select Move to Trash. When in the new window, check Delete personal settings and select Reset again to complete EasyFlashUpgrade.net removal. Once these steps are finished, EasyFlashUpgrade.net should be removed from your Microsoft Edge browser. Here, select EasyFlashUpgrade.net and other questionable plugins. Click Remove to delete these entries. Now you will see Reset Firefox to its default state message with Reset Firefox button. Click this button for several times and complete EasyFlashUpgrade.net removal. Here, select EasyFlashUpgrade.net and other malicious plugins and select trash icon to delete these entries. Click Reset to confirm this action and complete EasyFlashUpgrade.net removal. Here, select Extensions and look for EasyFlashUpgrade.net or other suspicious entries. Click on the Uninstall button to get rid each of them. Now you will see a detailed dialog window filled with reset options. All of those options are usually checked, but you can specify which of them you want to reset. Click the Reset button to complete EasyFlashUpgrade.net removal process. This entry was posted on 2015-01-12 at 22:33 and is filed under Adware, Viruses. You can quickly scan the QR code with your mobile device and have EasyFlashUpgrade.net virus manual removal instructions right in your pocket. How did you remove EasyFlashUpgrade.net virus?